Hikvision and Dahua are two of the most popular IP camera brands among DIY enthusiasts. Most of my cameras are Hiks, but that’s more due to my lack of experience when I first got into DIY CCTV. Often when I saw recommendations being made online, it went like this: “Avoid Foscam, go for Hikvision”. So you can understand when it came to pulling the trigger, I was leaning towards Hikvision. Dahua was also mentioned but there were definitely fewer people using them compared to Hikvision. There didn’t seem to be any particular reason other than Hikvision being a bit cheaper. I have written extensively about Hikvision in this brand guide, so I think its time to learn a bit more about Dahua. According to IHS, 53% of all security cameras shipped in 2015 were network (or IP) cameras. While Hikvision is the world leader in IP cameras with a global market share of 17% forecast in 2017, Dahua comes in second with a forecast of 5.5%. I will look at the 4MP IP cameras as this is the most common resolution for newer IP cameras sold. 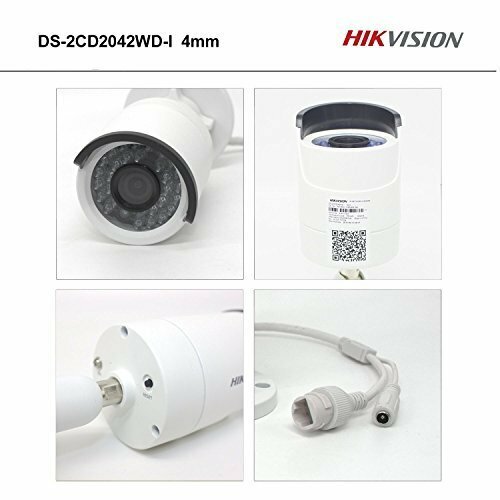 Both the 4MP Dahua and Hikvision have the most common sensor in this class of IP camera, a 1/3″ progressive scan CMOS sensor. Let’s put that into perspective – the highly rated $1300 prosumer Canon Legria HF G25 video camera also has a 1/3″ sensor, albeit at 3MP. The size of the sensor has a huge bearing on the low light ability of a camera, whether it be a camcorder or a security camera. The larger the sensor, the greater its ability to gather light and so do well in low light conditions. But as you cram in more and more pixels into the same size sensor, they get smaller and smaller, which adds noise. Noise is the bane of low light video and reduces the detail that you can get out of your video. So while security camera manufacturers have pushed pixel count from 3MP to 4MP, they have not increased the sensor size. However both the Hikvision and Dahua 4MP models have true 120dB Wide Dynamic Range (WDR) to help improve video quality. Both cameras can do a minimum illumination of 0.01 lux and 0 lux with IR on. It’s interesting to note that the Hikvision goes down to a lower f-stop to achieve this than the Dahua. Both cameras have fixed lenses available at different focal lengths. Hikvision does 4mm and 6mm, whereas Dahua offers more options with 2.8mm, 3.6mm and 6mm. Let’s get the basics out of the way, both cameras support ONVIF and RTSP, the two most important features you should look for in an IP camera. ONVIF ensures that your camera will work with standards-compliant equipment from 3rd party manufacturers. RTSP allows even non-ONVIF equipment (such as software) to access the security camera’s video stream. Examples are video players like the popular VLC player. When it comes to features, one striking difference is that the Hikvision 2CD2042WD-I has a max bitrate of 16Mbps vs. the 10 Mbps of the Dahua IPC-HFW4421S. This shouldn’t be an issue though, I’m quite happy with the 6Mbps stream from my Hikvisions. This bitrate provides sufficient quality while extending the number of days I can store on the QNAP NAS that I use as my DIY NVR. An unusual feature the Dahua has is the ability to provide three simultaneous video streams at different resolutions, whereas the Hikvision can do only two different resolution simultaneously. Now, its important to note this is not the limit of simultaneous streams of a particular resolution, its only the number of different resolutions it can encode simultaneously. So for the Dahua, you could have 10 streams recording/viewing at full 4MP, 5 at D1/CIF and another 5 streams at 720p resolution. 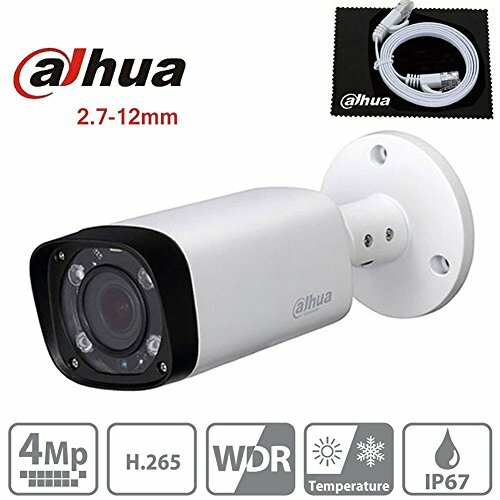 Both cameras support basic motion detection as well as advanced motion detection techniques. But the Dahua has the advantage here with face detection, abandoned object and missing object detection. I can’t emphasize enough the importance of these advanced motion detection methods in reducing false motion alerts. So as you can see the Hikvision and Dahua are very similar but have just enough between them to warrant a closer look. Also check out the other recommendations on our best outdoor IP cameras list. Note: "Power supply is not included"
Arlo vs. Arlo Pro 2 – What’s the difference? I haven’t tried any of the two particular cameras you reviewed, but, assuming that it’s still true, another point worth mentioning about both Dahua and Hikvision is that they usually ship cameras set to a static ip, and DHCP is not on by default. That makes it a bit of a hassle for novice users to set up. This is one of the things that’s nicer about the Amcrest cameras, which ship with DHCP on by default. What is your opinion of WatchNET product?